Introducing Our Stay Beautiful Program! A typical home-owner has their carpets professionally cleaned about once a year. In our experience, we’ve found that carpets will once again start to get that dingy, “lived on” appearance after only about six months — especially in high-traffic areas. Because it happens gradually, you may not even realize that your carpet’s appearance is less than satisfactory! That’s why we came up with our Stay Beautiful Maintenance Program. 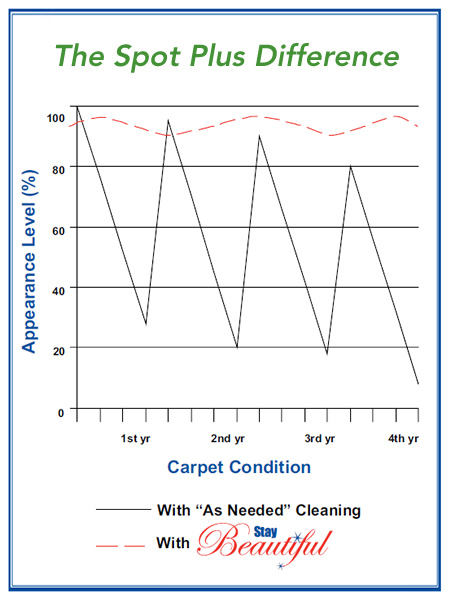 Take a look at the chart below: the solid black line represents the typical timeline for carpet appearance, from excellent right after cleaning, to sub-standard following time and use, back to excellent again after cleaning, and so on. With our Stay Beautiful program, we keep your carpets consistenly closer to peak appearance. Carpet technology has improved to the point where a new carpet often gets replaced because it has “uglied out” long before it actually wears out. Cleaning more routinely keeps fiber-damaging grit to a minimum, extending the “appearance life” of your carpet. Obviously, it’s much healthier to keep as much dirt as possible out of your living environment. And what better way to keep a cleaner and healthier home than a regular, planned maintenance program like Stay Beautiful! What else can Stay Beautiful do for you? These days, manufacturers often require an annual cleaning to keep your carpet covered under warranty. Routine cleaning takes that worry off your plate. With our visits planned well in advance, you can minimize disruptions to your already-hectic schedule. And best of all, you can plan your budget without worrying about a lot of money out of pocket for an “I just can’t stand how my carpet looks any more” cleaning — we’ll keep things looking great year-round! We’d love to tell you more about the benefits of this great program. Call us today at the phone number below for more information, or go ahead and schedule an appointment!